Environmental Policy – The Schazoo Pharmaceutical Laboratories (Pvt) Ltd. 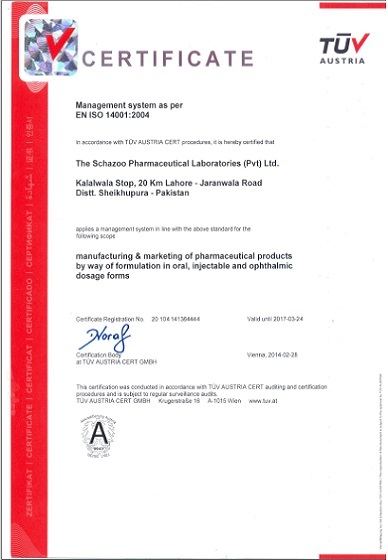 The Schazoo Pharmaceutical Laboratories (Pvt.) Ltd. strives to assure the best possible protection of staff, immediate surroundings and the environment. Integrate environmental factors into planning and standard operating procedures, to prevent pollution. Provide environmental management training to the company personnel to make them aware of their responsibilities and understanding of environmental issues. Assess the potential environment impacts of activities, products & services periodically and regularly monitor and audit the environmental performance. Continually improve environmental performance, which are achieved through the impacts of emissions, wastage and efficiently using energy, water and other resources. Comply with applicable legal requirements and with other requirements related to environmental aspects. Communicate the environment policy of the company to the suppliers, customers and general public to encourage changes in the social behaviour of people.